Gaborone (Botswana) (AFP) – Africa could lose 20 percent of its elephant population within a decade, conservation groups warned Monday as governments met in Botswana to discuss measures to curb poaching. An estimated 22,000 elephants were illegally killed across the continent last year, as poaching reached “unacceptably elevated levels,” according to a report by CITES, TRAFFIC and IUCN. “If poaching rates are sustained at current levels, Africa is likely to lose a fifth of its elephants in the next ten years,” the group said. The study was released as experts and ministers met in Gaborone to look at ways to stamp out the slaughter, fuelled by a growing demand for ivory in Asia. The meeting is expected to adopt 13 “urgent” steps to stem the tide of illegal elephant killings. These will include classification of trafficking in ivory as a serious crime and securing stiff sentences for offenders. Prevention would be tackled through better arming of national protection agencies and discouraging demand in destination countries. The meeting will also recommend the adequate securing of government- and privately-held ivory stockpiles so they do not make their way into wrong hands. “Current elephant poaching in Africa remains far too high, and could soon lead to local extinctions if the present killing rates continue,” said Scanlon. He described the situation in central Africa, where the estimated poaching rate is twice the continental average, as “particularly acute”. Researchers believe that poverty and weak governance in African countries harbouring elephants are driving forces behind a spike in poaching. Ivory trade is banned under the CITES, yet the illegal trade is estimated to be worth up to $10 billion (7.4 billion euros) a year. In the past 13 years, the quantities of ivory traded have steadily shot up, according to Tom Milliken, an expert with the wildlife monitoring agency TRAFFIC. “2013 already represents a 20 percent increase over the previous peak year in 2011. We’re hugely concerned,” said Milliken. In terms of international crime, wildlife trafficking now ranks fifth after narcotics, counterfeiting, the traffic of human beings and of oil, according to estimates cited at the meeting. Beyond worries about the species’ survival, elephant poaching has given rise to security and terrorism concerns. Proceeds from ivory are “known to fund terrorism acts, support conflicts” said the conference document. Experts suggest the funds could be financing groups such as Somalia’s Al-Qaeda linked Shebab, Uganda’s Lord’s Resistance Army and Sudan’s Janjaweed militia. 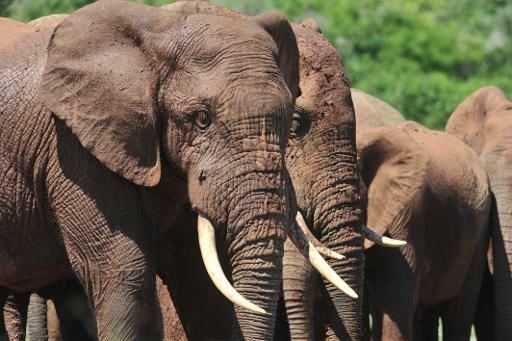 In recent years ivory trafficking routes appear to be shifting from the traditional west and central African seaports to east Africa with Kenya and Tanzania as the main exit points. Most of the ivory ends up in Thailand and China. Elephants still exist in between 35 and 38 African countries with large tracts — about 55 percent of the continent’s population — still found in southern Africa. Botswana, which is co-organising the conference with the International Union for Conservation of Nature (IUCN), holds the largest population of elephants in Africa, according to statistics from conservationists.